Between work and personal life, I've had a hard time (like most people, so I won't bore you with the details) getting time to Blog. I'm still working on Part 3 of the AF Sales Pitch analysis, and hope to move through the rest of the brief soon. In the meantime, here is a little something from the archives at work. Advanced military aircraft don't magically fly away when they roll off the assembly line the first time. The planes must be 'proven' before they fly. This is an old (20+ years) rambling called "The Lab Rat's Creed" that is truer than ever. It is making the rounds again on my current program (for, um, some unknown reason) and unless you're a Lab Rat, you've probably never seen it before. We are lab rats. We’re proud of it. We support the program by building, maintaining and operating the lab, and that lab needs to be worked on by people that know the equipment. Who’s gonna do it … you? We have greater responsibility than you can possibly fathom. You have a luxury – the luxury of not knowing what we know. The lab has to perform just like the plane, and then some. And when it doesn’t, no management directive, no memo, or no amount of ranting and raving can fix it. Other groups have the advantage of being specialists; they may know their system, or their hardware, or their software, or some other little piece of the overall puzzle. We, on the other hand, must know how everything fits together. We are the ones who integrate the pieces together and make it work. Some say that how it all comes together in the lab is proof of how great their original concept was to begin with. Actually, it’s a miracle that it comes together at all. And just remember, THE MIRACLE HAPPENS HERE! Our very existence, while grotesque, dirty and often incomprehensible to you, is what built this lab and keeps it up and running. We know that you must realize this sometimes, like when you’re answering to your boss. That’s when you WANT us in the lab; that’s when you NEED us in the lab! We use words like HARD WORK, SWEAT, HOT, COLD, HEAVY, DIRTY, UNDERPAID and #$%! … We use these words as the backbone of a life spent supporting labs; you use them as a punch line! You want the truth about how we put out so much work? How we get by with half the number of people we should have? You don’t want the truth; you couldn’t stand the truth. Deep down you know it can’t be done by armchair management or good old boy politicians. Don’t try to flatter us by making an occasional token appearance in the lab. We know that you really only want to be in the lab when some VIP is in town. Don’t feel that you need to establish a dialogue with us. We would rather you just said thank you and went on your way. Either way, we don't give a jolly green damn what information or metrics you think you are entitled to; just get out of our way and let us work! Another good question! What is the answer? 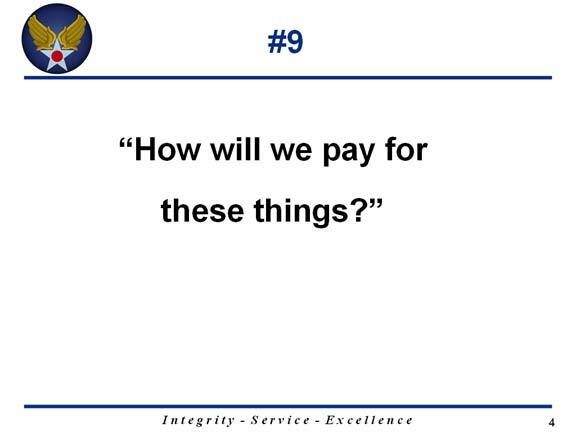 Now Question 8 above is a REALLY good one! Surprise!-- It’s a Money thing. Not surprised? Me neither. 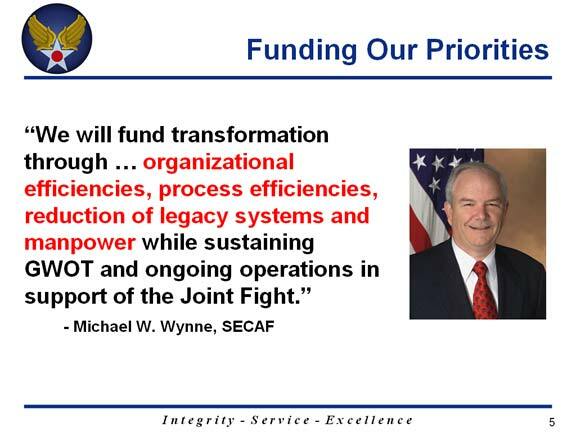 So does the AF thinks it is spending too much on people in their slice of the defense budget? Let’s look at the evidence they present……hmmmmmm. Nope, no useful data here, but it is a hell of a sales graphic as well as a great “dumbed down for management” slide. What’s wrong with this chart? 1. This represents only ‘people dollars’. 2. ‘People dollars’ have absolutely nothing to do with any other costs, in that Congress provides funds for these costs separate and distinct from other costs. Call it ‘earmarked’, but we (former) ‘acquisition officials’ see it as in different pots (or buckets) of money. 3. Congress sets the amount and DIRECTS the expenditure of these funds as ‘people dollars’. 4. If the DoD spends the money for any other purposes without an OK from Congress then somebody goes to jail. 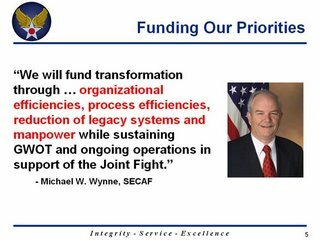 Is the AF being pressured by Congress to reduce manpower costs? Even if you could find a quote that says otherwise. How do we know this? 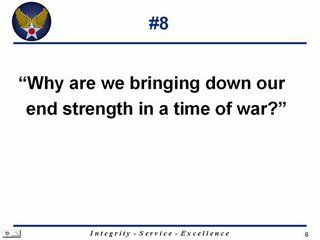 Because on behalf of an appreciative nation and to help combat the impact of inflation on the individual troop and employee, Congress keeps giving military and civilian DoD employees something called ‘Raises’. How big are the raises? Big enough that most of that rise in costs after 1995 could be largely accounted for by raises in base pay alone: 49+% for military personnel and 34+% for civilian employees (see charts below). And none of what I’ve mentioned so far accounts for increases in Per Deim, Housing Allowances, Locality Pay: all of which have increased as well. 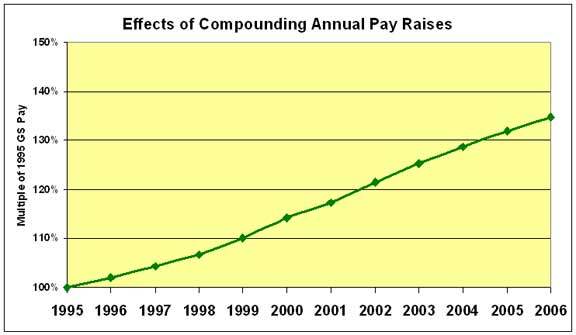 Most years, raises are generally not any bigger than before, it’s just that (for the years shown on this chart) the increases in pay until 1995 were being offset by reducing the number of people. Stop reducing numbers of people and the impact of raises on total personnel costs becomes apparent. If chart 7 above alarms you, then you are also probably sit around wondering why it is our prison population continues to grow as the crime rate drops. A few other things jump out here. The fusion of civilian and military pay numbers is no accident. The aging Civil Service force is a ‘Senior’ force in more ways than one: The GS force is so top-heavy with the highest paid people reaching retirement age that the exodus isn’t expected to peak until around 2008-2009 (just off this chart ‘coincidentally’). We need not go into all the other congressionally-directed changes to the compensation schemes in detail, but here’s one other to consider. Congress has also raised “pay caps” in the period of ‘concern’. 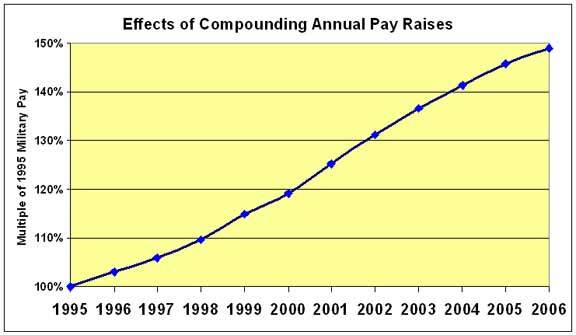 While some federal employees make X amount of money according to the pay charts, the actual amount paid out is limited to a specified level (X minus Y), so that the most senior (and costly) military and civilians are actually getting more of what they are supposed to get in the first place. It is very complicated (It IS Congress we’re talking here) so if you want to know more about this quirk you can go here and here to begin your exploration of the wonderful world of government compensation. With the exception of pay raises, much of what I’ve pointed out has to pale in comparison to the impact of a little thing called Ops Tempo. Note how Operation Allied Force (’99) doesn’t even cause a blip on the cost line, and how the slope really increases in 2001. 2001….2001…..something big started happening in 2001. (Oh yeah, now I remember!) What percentage of this perceived increase can be directly attributed to operations in Afghanistan, Iraq and elsewhere? 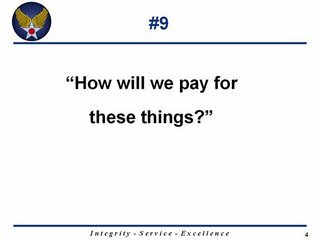 There are some quirks to the indirect and overhead personnel cost accounting we could ponder, but you get the point. 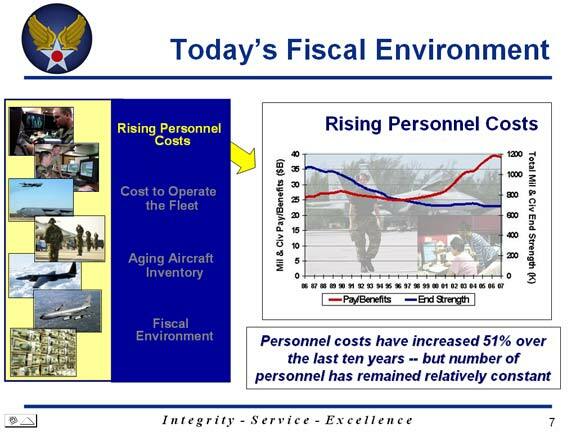 All things considered, I want to know how the AF is keeping personnel costs so low! As you can tell from the left hand side of this slide, the presenters are leading up to the real concern that needs attention: the hardware. That someone at the SecAF level seems to think that there is any correlation between people costs and hardware costs anywhere inside the mind of the typical Joe Congressman is disturbing. That someone or someones ALSO thinks that by marketing a plan that sacrifices PEOPLE on the budgetary altar they can somehow gain direct and proportional favor from the "budgetary gods" to fulfill their future hardware needs is LUDICROUS: No bargain made with a previous Congress (or with the Devil) has ever meant a damned thing to the NEXT Congress or Congress after that. Somebody! Please, PLEASE fire the Effin’ MBAs and Bring Us Some Leaders! --Rumor has it the Marines still have a few. In the next installment: We get a little ‘Technical’. I’m going to be a little self indulgent here and relish a small validation I feel in thinking along the same wavelength as the fabulous Roger Simon. Y’ see, I wrote an e-mail on August 18th concerning the roots behind the craziness of Catherine C. Mayo that parallels Mr. Simon’s observations today on the larger picture behind the Valerie Plame affair. When I wrote the e-mail I thought about blogging it as well - and now I’m kicking myself for not doing so earlier. Is BDS (Bush Derangement Syndrome) a distinct form of mental illness and if so, what would it have been called before there was a Bush? Should BDS really just be considered a colloquial reference for a subset of a larger pandemic: the Aging Hippie Syndrome? AHS seems to be brought about by too little adult guidance and/or instruction in western classical thought in the formative years coupled with cornucopian drug abuse and possibly overexposure to black lights. There is evidence that those individuals with over-inflated senses of self and entitlement are particularly vulnerable (Hence the apparent overrepresentation of ‘elite’ university alumni in the affected group). 1. Loss of political power: When this happens, the AHs must confront the reality that they are not in the mainstream. 2. Sudden Trans-Cultural Conflict: While initial effects of this can be dampened via ‘projecting’ fault as it fits an existing world-view, over time the web of self-deception breaks down and an overwhelming angst can result in episodes of irrational and random ‘lashing out’. 3. Increased Leisure Time: As AHs reach retirement age, and/or become ‘empty-nesters’ they find themselves with more time for reflection and eventually, if not still/again engaging in the recreational use of drugs, they may come to realize two previously unrecognized facts of life. One is the realization that the world moves on with or without their involvement and the other is that they are actually mortal. In the beginning the left went along with Bush, but the minute things began to lag in Iraq, they deserted him in a flash. At first glance the reason was political but on a deeper (and I believe more important) level the reason was psychological. The left was in a rush to reclaim its lost idealism (the "it's about oil" nonsense was but an obvious example of this), to preserve its disintegrating sense of self. 3. I wish I could write about this kind of stuff with half the skill of Roger Simon.